LONG BUCKBY FC was formed in 1937 under the name Long Buckby Nomads. They played in local leagues up until 1969 when they were accepted into the United Counties League. After winning Division One twice in a row and were promoted to the Premier Division in 1972. They were longtime members, even winning the championship in 2012. However last season their long run ended and they were relegated with only 5 wins all season and conceding 118. 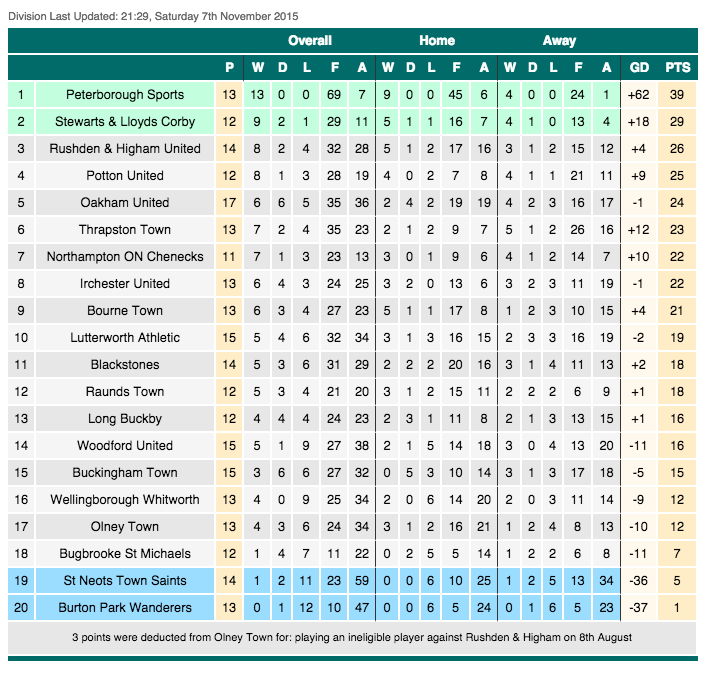 It was overdue after the 2 previous seasons had seen them right down the foot of the table and this season things had not improved much, with the side struggling in United Counties Division 1. In the FA Cup, their league winning season of 2011/12 proved to be their best year in this competition too. After beating S&L Corby, Rothwell Corinthians, Thrapston Town & Bridgnorth they exited with a narrow 2-1 defeat at Evostik NPL side Kidsgrove Athletic. The previous 2 seasons had seen them reach the FA Vase 5th round, but with Wembley in their sights, they lost to Gresley and Leiston, both of whom have gone on to better things. Various local cups have been won, most recently the Maunsell Cup in 2009. For this Saturday I'd been hoping to do an FA Cup 1st Round game. When the draw came out I was hoping for either a new ground (only Salford & North Ferriby were left) or a team where I had lots of mates. Neither of them came up, but I was quite pleased when we got Halifax away. 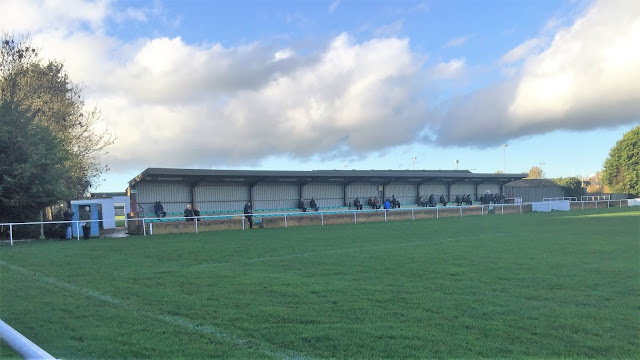 It was a ground that I had done on the Oxford City team coach a couple of years ago and as the town was one of the better I had been to, so I pencilled in a revisit. That was until the BBC, in their infinite wisdom, decided to move it to the Sunday and a 2PM kickoff. What with me working until 12, it was impossible for me to go. So I sought about looking for an alternative Saturday game. Anwar would be coming, but as he had his kids with him, it could only be a local one as they get travel sick. 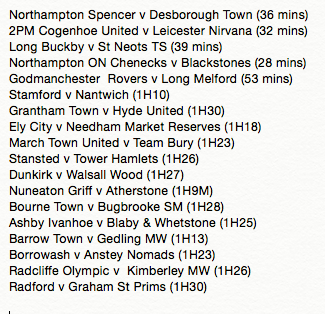 So out of around 5 options, we decided that the clash between Northampton Spencer and Desborough Town was the one to go for. On Friday night I watched Salford City beat Notts County 2-0 and got even more annoyed that Wycombe would not be playing them next Saturday. They’d have been ripe for a beating, but the game had been called off due to international call-ups. I contented myself with the fact that I’d be dropping a couple of hoppers off at Blackpool and doing a long wanted visit to AFC Fylde. Still, I had a restless nights sleep, waking around 5AM and watching TV and going on my computer until it was time to leave. A large chunk of that was working out the options for today's game with the Northampton Spencer game looking very much in doubt, due to the constant rain. Leaving at 10.30 I had a slow drive to Aylesbury, thanks to various Dawdling Dorises, Hesitant Harrys and Slow Sues, so I arrived at Anwar's at 11.05. We were soon on our way to Milton Keynes, arriving at 11.45. As we parked the car I got the word that Northampton Spencer was off. Had we had more time I'd have gone to Cogenhoe v Leicester Nirvana but it kicked off at 2, presumably due to a problem with the host clubs floodlights. 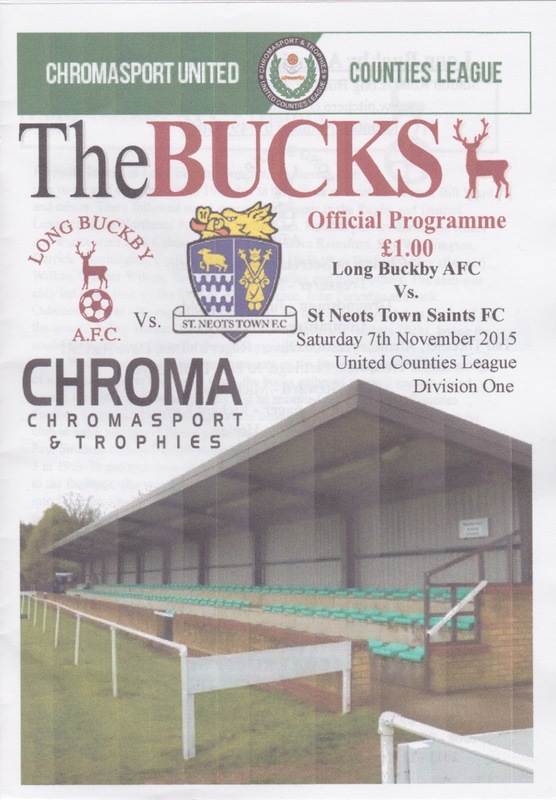 Instead, we decided on Long Buckby v St Neots Town & Saints which was a normal 3pm kickoff. 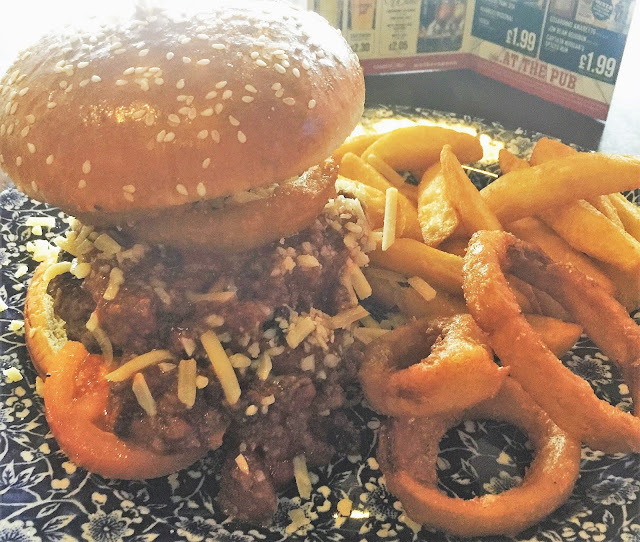 After a quick look around the market, I went to The Moon Under Water, a Wetherspoons in the Xscape centre in MK. There I had a Texan Burger with all the trimmings, a pint of Thatchers Big Apple and an Orange juice. After a brief look around the shops I met up with Anwar and Hicham and we were on our way. Leaving at 1.30 the journey took 45 minutes, meaning it was 2.15 by the time we got there. I paid £6 to get in plus £1 for a programme. After a look around I still had 40 minutes until kickoff so I went to the bar for a pint of Strongbow for a reasonable £2.90. I sat in the bar and watched news of called off games, with Torquay United v Wrexham being called off at 1.15 by the referee. There seems to be any excuse for a call off nowadays, frustrating fans of the teams and groundhoppers alike. Apparently, only one corner of the pitch was affected, so surely those involved could use their gumption and adapt their game to suit the conditions. However, it seems as fans are the last thing that matter, despite the fact that without them, football would not exist. After I'd finished my pint I went into the ground and got in with a few minutes to spare. There was a minutes silence before the game to commemorate those who died in the war, the tribute being fully deserved and well respected. St Neots might have been second-bottom, but they started the game by far the stronger team. Within the opening minute, they had hit the post with a great shot. 20 minutes in and they were ahead, a really smart move ended with a through ball to their number 11 who capped a fine game with a goal. Though the visitors were much the better side, the home side did have chances of their own and on 40 minutes it was all square. Long Buckby getting their equaliser thanks to a shot into the top right-hand corner. Halftime and I met Adam, a Coventry fan who reads my blog, We had a brief chat as I got my half time bovril before I returned to the stand for the second half. Again it was the visitors who were the better side, but one man whose performance dipped considerably was the referee. He did a sterling job in the first half in the main, letting the game flow. But following a couple of incidents where a player questioned his decision (in both cases the player was booked for their protests) he got the hump and was forever whistling and disrupting the game. St Neots got the lead their superiority deserved on 78 minutes when the referee adjudged there to be a foul just inside the area and awarded a spot kick. It was converted to make the score 2-1 and the visitors looked home and dry. Another foul caused handbags in front of the dugouts and this resulted in Long Buckby having a player and someone off the bench sent off. The elderly linesman strolled across the pitch as if he was wearing high heels to help the ref sort the situation out. I heard later that every single player on their side was booked, though I didn't see any confirmation of this. In any case, they were a much-improved team with 10 men and they got their equaliser with 5 minutes to go, capitalising on a good through ball with a neat low finish. From then on they looked the most likely side to win, even with St Neots hitting the post in the dying embers of the game. The referee who had taken some stick from the crowd blew the final whistle, though I'm certain we were due more injury time thane he played. It had been a good entertaining game, and myself, Anwar and Hicham made our way back to the car in a decent mood. We learned of some FA Cup shocks - Stourbridge winning at Dover, Eastleigh winning at Crewe and Barnet beating Blackpool. Though perhaps most satisfying was Altrincham's 1-0 victory over Barnsley. The game had been due to have been played on Sunday, which would have netted Alty a very valuable £12,500 in revenue for being shown on the BBC programme. However the Yorkshire club refused to move, the FA backed down, despite forcing FC United to move against their will. Double standards it seems. The journey home was a bit slow on lots of single carriageways but I dropped Anwar and Hicham off at 6.10, getting home myself at 6.35. I spent the evening writing my blog and watching TV before going to bed after Match Of The Day. STATION ROAD is a tidy venue, which would probably serve the club up to step 4. There is just the one stand, but it's a big one, 3 rows of seating stretching a good portion of the pitch and seating around 150 fans. The rest of the ground is open standing. The tea bar offers snacks, drinks and pies, while the bar does the usual range of drinks, as well as a few local ales.